Will the NDA government, whose economic programme hinges on boosting the manufacturing sector, be able to bring about the required change? The coming Union Budget may provide some of the answers. Last year, Tata Steel started the first phase of its steel plant in Kalin-ganagar, Odisha. Spread over 3,741 acres, at full capacity, it will be India's largest single-location greenfield steel plant. But what is more telling is that it is just one of the few greenfield steel plants to be built in India in the last 20 years. It sure did take some time coming. Planned at a cost of Rs 15,000 crore, it was to start in 2010, but got bogged down by an agitation by locals who claimed they owned a part of the land given to the company. After January 2, 2005, when 13 agitators were killed in police firing, the work stopped. This took the company by surprise. Tata Steel had, after all, built Jamshedpur, then one of India's most modern cities, around its steel plant. Surely, the plant would help Kalinganagar, it thought. However, the sense of injustice among the locals, who were offered just Rs 37,000 an acre by the government in 1993, overrode everything. "Till January 1, 2005, we thought the land was ours, as we had paid for it," says Rajiv Kumar, Vice President, Operations, Kalinganagar project, in Tata Review, the Tata Group's in-house magazine. "We did not foresee any problem. We had the Tata name, we had been in Odisha for 100 years, and we believed we had built social equity with the community. But some stakeholders did not see it that way, there were others who were fiercely opposed to us, there was local politics. We were just not aware of the factors at play," he says. The Tatas were being fed this bitter medicine at another place too. Around the same time, Tata Motors' Nano project in West Bengal was facing a similar problem. Unlike Kalinganagar, though, it was resurrected at Sanand in Gujarat. Critics said Kalinganagar would meet the same fate. "We ignored the naysayers, went to work and, slowly, bit by bit, got the project back on track," says T.V. Narendran, Chief Executive Officer, Tata Steel. The work started in 2010. A generous relief and rehabilitation package that included a higher price for land, jobs, money for building houses and monthly allowance won over the agitators. But the extra payout and time overrun spiked the project cost by 75 per cent to Rs 26,000 crore. By 2025, when the project reaches its terminal capacity of 12 mtpa, the cost is estimated to swell to Rs 50,000 crore. Few companies have the bandwidth to take this kind of risk. One needs to only look at Korean steel major Posco's 12 mtpa steel plant at Jagatsinghpur, a mere 120 km away. After trying for 10 years, the company, six months ago, shelved what was to have been the biggest foreign direct investment in the country. Building a factory in India is not for the faint hearted. Even if a company is fortunate and manages to buy land - which, by the way, is becoming more and more difficult, expensive and time-consuming due to complex laws, people's rising expectations and local politics - that is just a start. 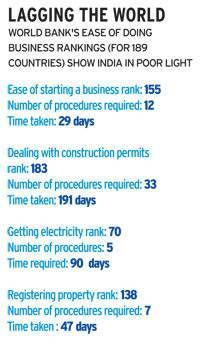 A manufacturing company in India, on average, has to comply with nearly 70 laws and regulations. Apart from the multiple inspections, it has to file around 100 returns in a year, according to a 2013 report by consultancy firm Deloitte. 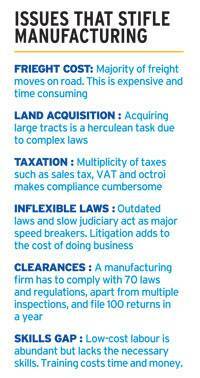 Then there is the double maze of tax and labour laws that can be a big pain even in the best of times. Poor infrastructure does not help either. Will the NDA government, whose economic programme hinges on boosting the manufacturing sector, be able to bring about the required change? Will it be able to debottleneck the process of setting up and running a factory in the country so that its plan to create millions of new jobs in manufacturing sees the light of day? The coming Union Budget may provide some of the answers. Despite a high-decibel campaign to cut the red tape in manufacturing and services, India ranks a poor 130 out of 189 countries in World Bank's Ease of Doing Business rankings. Its performance on some parameters is abysmal (see Lagging the World). "Our compliance cost is huge. It has not come down," says R.C. Bhargava, Non Executive Chairman of Maruti Suzuki, India's largest car maker. "On the contrary, due to the new Companies Act, it has gone up. Industry has to become competitive globally. But we have the age-old socialist mindset. Everybody is scared of helping industry." Problems in acquisition of land, delays in environmental and other clearances and infrastructure bottlenecks have taken a toll. In the past five years (2011 to 2015), new projects have seen a marked reduction of 44 per cent from the period between 2006 and 2010. The value of stalled projects more than tripled during the period (see No Respite on Stuck Projects). Worse, straddled with huge distressed assets, core sector companies are more concerned about avoiding default rather than making fresh investments. As a result, India's investment-to-gross domestic product ratio has fallen for five straight financial years now. The NDA government has tried to correct this through a massive increase in investments to build infrastructure. It is likely to follow this policy in the coming Budget, too. "Investments have not picked up significantly across the board. The number of proposals and announcements has risen only in specific sectors. Industry is still taking a wait-and-watch approach given its subdued performance in the first three quarters of the financial year," says Madan Sabnavis, Chief Economist at credit analysis and research firm, Care Ratings. Growth in the manufacturing index has been above 5 per cent only in five out of the 35 months between January 2013 and November 2015. On 12 occasions, the index has contracted (see Manufacturing Under Pressure). "Lower interest rates should help, though the real challenge is subdued demand, given that there is huge spare capacity. Infrastructure could be a starting point for investment, which is separate from the issue of demand," says Sabnavis. Right now, manufacturing accounts for 17 per cent of India's GDP. This compares unfavourably with other Asian economies such as Thailand, Indonesia, South Korea and China (see Share of Manufacturing in GDP). 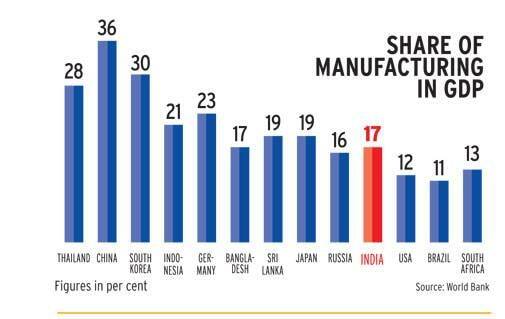 For a country whose workforce swells by 12 million every year and where 65 per cent people are below 35, fast manufacturing growth is a must for job creation. "For India, employment generation and skill development are the top priorities," Prime Minister Narendra Modi had said while launching the National Skill Development Mission in New Delhi last July. Yet, industry says not enough has been done. Surplus manpower is estimated to be 40-50 million over the next decade, even though 110 million workers will be required in 25 select sectors, including textiles, automobiles and construction. Plans to plug this gap remain mostly on paper. "It is strange that little attention is being paid to labour-intensive sectors," says Sudhir Dhingra, the owner of Orient Craft, one of India's largest garment exporters. "Too much attention is given to revenue generation. Employment generation at the lower echelons is neglected. The government can give industries a 10-year tax holiday and link the benefit to how much additional employment they generate." The textile and garment sector, the second-highest job generator in the country after agriculture, is a good example of what is wrong with India's manufacturing. Looked at as a sunrise sector after the phasing out of global quotas in 2004, it lost out to relative upstarts such as Bangladesh and Vietnam that had lower labour costs and duty-free access to some of the biggest global markets such as Europe. "Simply put, we are not competitive on price?.we cannot be at zero duty for Bangladesh," says Dhingra. "The India-EU FTA would have benefitted us but the work of powerful automobile and wine and spirits lobbies went against us. With all its factories, how much employment does Maruti generate? Just 15,000-17,000. Orient Craft alone employs 32,000 people directly and twice this number indirectly." If there is one handicap that is affecting India's manufacturers the most, it is lack of quality infrastructure. Most Indian ports and highways are congested and dilapidated, while railways are inefficient and expensive. At the same time, power is costly and, in some areas, unavailable. These are the areas where India's competitors, such as China, have a clear edge. Industry says if these additional costs are not offset, India will forever remain dependent on imports, even for things such as basic engineering products. Over 60 per cent demand in the estimated $100-billion electronics hardware industry, which makes a wide range of products from LED/LCD panels and mobiles to semi-conductors, is met through imports. The potential for growth is high. Demand is projected to be $400 billion by 2020 but domestic production is expected to top off at $75-100 billion. The $300-billion gap means the bill for electronics hardware imports could be more than the country's oil import bill by the turn of the decade. "We are not seeking protection. What we want is that some of these additional costs be offset. Give us power at a competitive rate or lower finance and logistics costs," says Vinod Sharma, Managing Director, DEKI Electronics. "This is one sector where you cannot say that China is strong so let's import from there. Electronics are used in a wide variety of industries. If we do not become competitive here, our manufacturing as a whole cannot be competitive," he says. The delay in implementation of a unified goods and services tax, or GST, has dismayed industry, though it remains on top of everybody's wish list. The tax would do away with a lot many inter-state taxes, simplify procedures and bring down the cost of many goods and services, giving a boost to manufacturing. It, though, is stuck in Parliament, and is unlikely to see the light of day soon. "It is a perfect example of how India is a noisy democracy. The opposition party opposes a reform just because the ruling party opposed it when it was in opposition. It does not help anybody," says Wilfried Aulbur, Managing Partner, Roland Berger Ltd, a consultancy. Will the coming Budget change the trajectory of India's manufacturing? Unlikely, as given the many constraints the government is working under and an uncertain global economy, overall expectations from the Budget are low. Besides providing some succour to the acutely depressed sectors such as steel, and increasing infrastructure spending, industry is of the view that the government cannot do much. "A dull budget is good news. We don't want radical changes every now and then. It is disastrous," says Marutis Bhargava. "There should be certainty in policy. Nobody wants duties to go up or down every year." A consensus on the GST Bill during the Parliamentary session would perhaps cheer industry more than the Budget.